The most famous snow festival is the Sapporo Snow Festival held on Japan’s northernmost island, Hokkaido. Over two million people make the trek to this winter wonderland every February to get a glimpse of the towering snow sculptures that take over Sapporo’s city centre. Regular air links run from all major Japanese airports to Sapporo’s New Chitose Airport. As mentioned, book early to get the best deals on budget airlines. From the airport you can take a direct train on the JR Chitose line straight to Sapporo Station and change to the Namboku line for Odori Station. The total travel time is just over an hour and will cost you around ¥1,300. I totally missed Hokkaido off my itinerary, are there any festivals near Tokyo? No problemo! Honshu is blessed with tons of snow this time of year so you can take the shinkansen (bullet train) to one of the nearby prefectures for skiing, snowboarding and snow festival-ing. 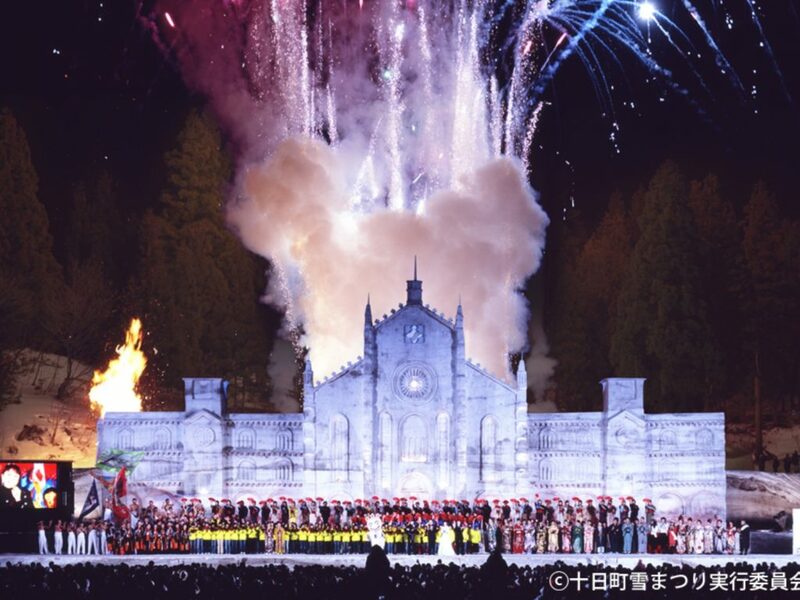 The closest festival to the capital is in Nikko in Tochigi Prefecture. Called the Yunishigawa Onsen Kamakura Festival it’s about two and a half hours from Tokyo. Good for a day trip, I know, but why not stay overnight and soak in the town’s numerous onsen (hot springs) between festivities? Snow huts can be found at the “Heike no Sato” — the main venue (these need to be booked in advance) — or you can sled down slopes at Yunishigawa Snow Park. The scenery is lit up at night and is best viewed with amazake, the region’s favorite sweet fermented sake drink. From Ikebukuro, take the Nikko-Kinugawa line to Kinugawa Onsen Station (taking just over 2.5 hours and costing around ¥4,000 one-way). Transfer to the hourly bus service from Kinugawa Onsen Station to Yunishigawa Onsen (taking roughly an hour and costing ¥1,750 one-way). You could also follow the modern Japanese Snow Festival back to its roots in Niigata by taking a trip to the Tokamachi Snow Festival, the very first contemporary snow festival that set the stage for their ever-growing popularity. An event-packed weekend celebrating the best of both contemporary and traditional Japanese culture gives the Tokamachi Snow Festival broad appeal. 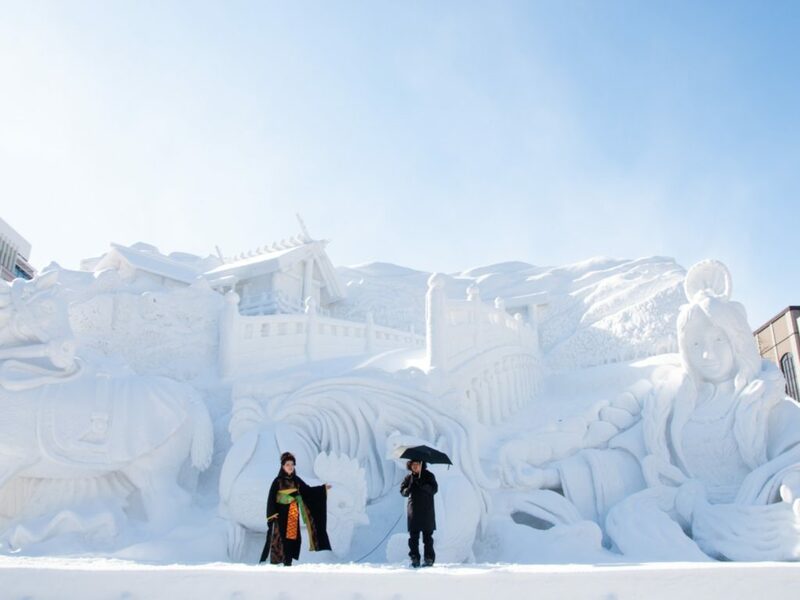 Similar to the Sapporo Snow Festival, snow-laden architecture takes centre stage and the festival closes with the Snow Carnival, a community event taking place on an epic stage made entirely from snow. There’s fireworks, a kimono showcase and a light show — this snow-fest has all bases covered. From Tokyo Station take the Joetsu Shinkansen and change to the Hokuhoku line, getting off at Tokamachi Station. With a journey taking around 1.5 hours and costing you around ¥7,500, this is one of the most easily accessible snow festivals from Tokyo. My skis are packed and ready to go, what’s good up north after a hard day on the slopes? Northern Japan is the bomb for adventure sports and snow festivals. Yamagata is a particular favourite with ski resorts like Zao Onsen offering a pick ‘n’ mix of sports, onsen and festivals. The Zao Snow Monster Illuminations are held from December until February which is also the best time to visit the slopes. 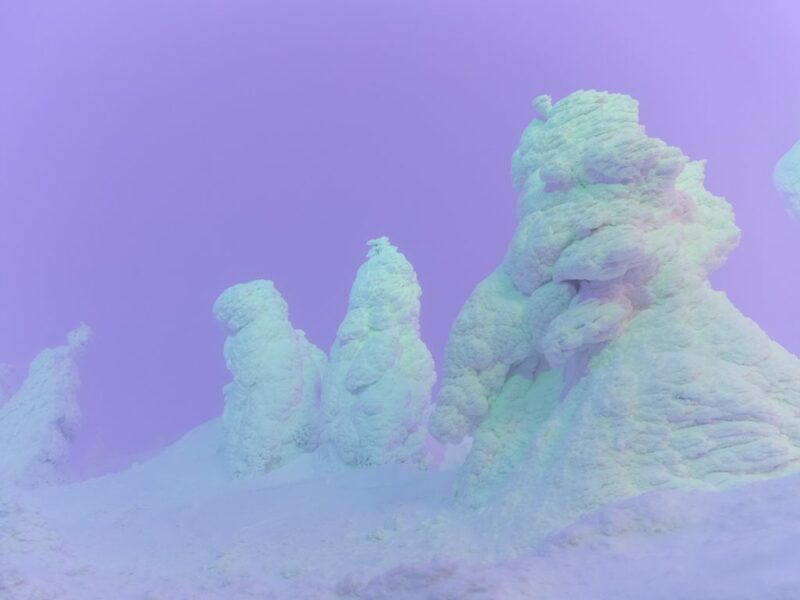 The “Snow Monsters” are actually trees on Mount Zao that have been buried under the snow, creating an eerie looking landscape that is best explored at night via the Zao Ropeway. Wrap up warm because temperatures at the top can get as low as -20°C (-4°F). From Tokyo, take the JR Yamagata Shinkansen to Yamagata. From there transfer to a bus heading to Zao Onsen (taking approximately 3.5 hours, costing ¥13,000). Alternatively during the winter months there is one daily overnight bus from Tokyo’s Shinjuku Station to Zao Onsen (eight hours one-way and costing ¥8000 for a round-trip ticket). On the return journey, from Zao Onsen to Shinjuku, the bus runs during the daytime. Seat reservations are mandatory. Aomori and Akita are two prefectures that often get missed off of people’s travel plans. Both have heaps of awesome sightseeing opportunities, as well as a decent resort scene. 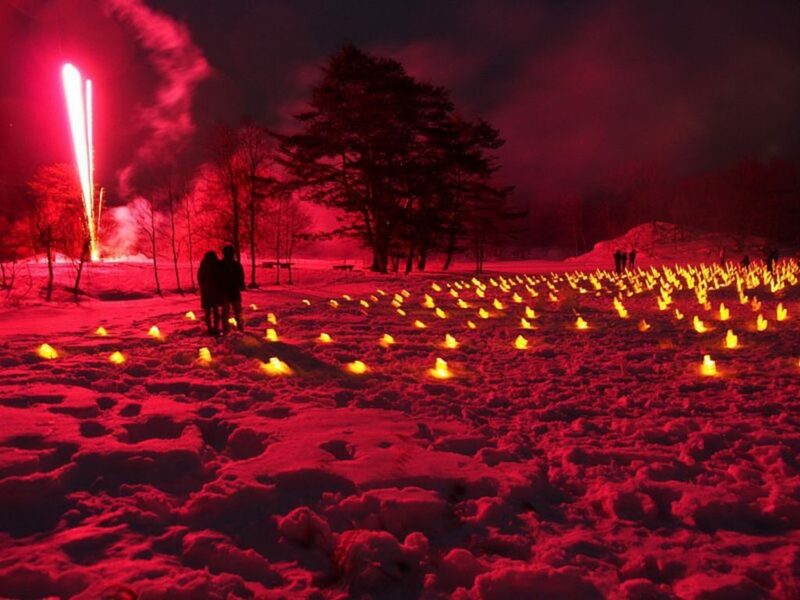 Aomori holds one of the region’s biggest festivals over five days in February in the form of the Hirosaki Castle Snow Lantern Festival. A top spot for cherry blossom viewing, the winter transforms it into a magical wonderland reminiscent of Narnia. 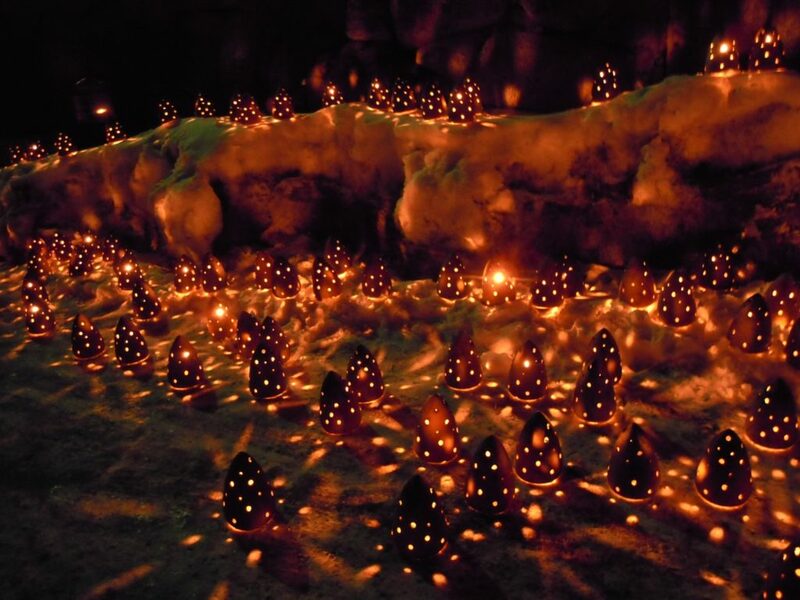 Illuminations are projected onto the castle’s walls and mini-igloos called kamakuras are lit with hundreds of candles. The event culminates in a spectacular fireworks display. Remember as you walk around that all of the stunning lanterns have been lovingly hand-crafted by locals who have been preparing throughout the harsh winter months for this moment! The fastest way to get to Hirosaki is taking the Tohoku Shinkansen from Tokyo Station to Shin-Aomori Station and transferring to local trains for the final duration (costing you around ¥18,000 for the 4.5 hour one-way trip). Konan Bus runs an overnight service between Ueno Station and Hirosaki Bus Terminal which takes just under 10 hours but for ¥5000-6500 one-way, is much more cost effective for the thrifty traveller. 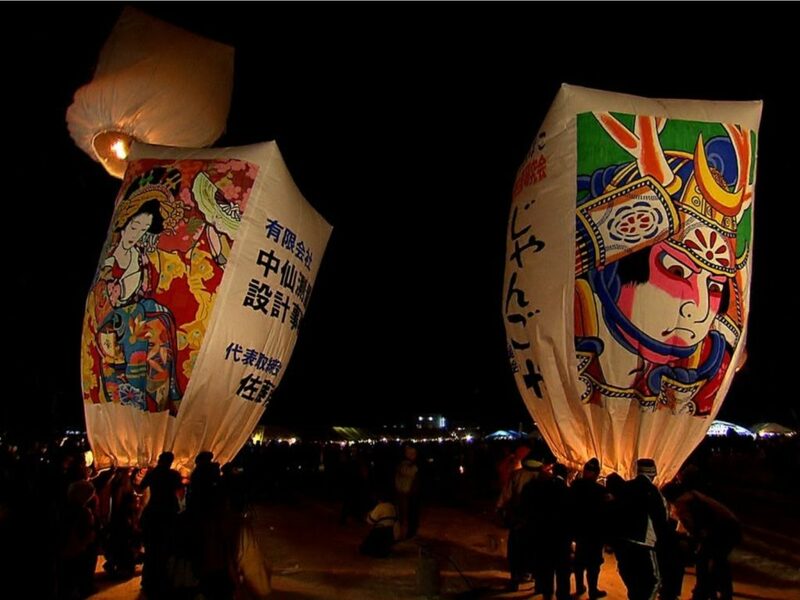 Akita’s Kamihinokinai Paper Balloon Festival sees over 100 balloons sent into the atmosphere on February 10 every year. These balloons aren’t your average birthday balloons; they can get as tall as eight meters and are painted with beautiful designs of geisha and samurai straight from Edo-era ukiyo-e prints, or adorned with hand-written wishes for the year to come. From Kakunodate Station on the JR Akita Shinkansen, take the Akita Nairiku Jukan Railway and get off at Kamihinokinai Station. It's a 7-minute walk from there. The total journey time from Tokyo is about 2.5 hours and will cost about ¥16,000 one-way. I’ve been meaning to pay the Fukushima area a visit, what’s the dealio there? 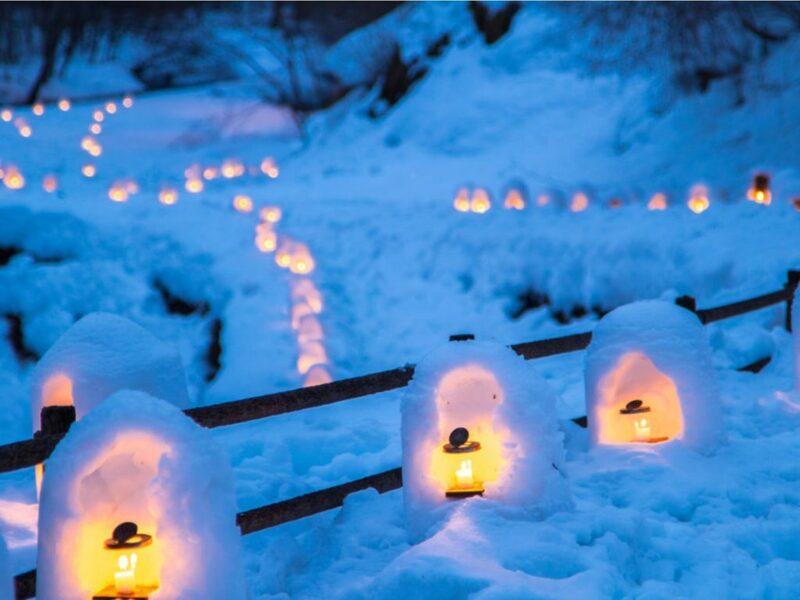 Fukushima is Japan’s best-kept secret when it comes to snow festivals. 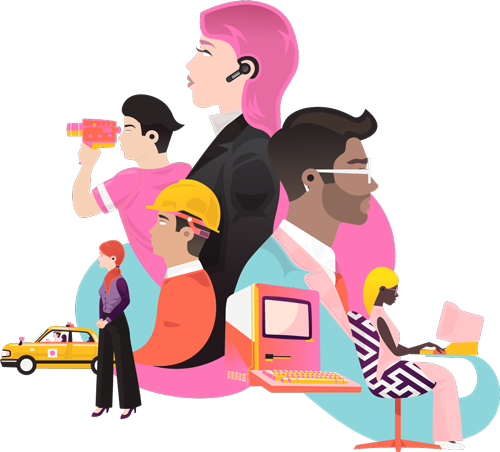 What Fukushima can’t make up for in fame, it does in quantity — Fukushima has three festivals for you to choose from. 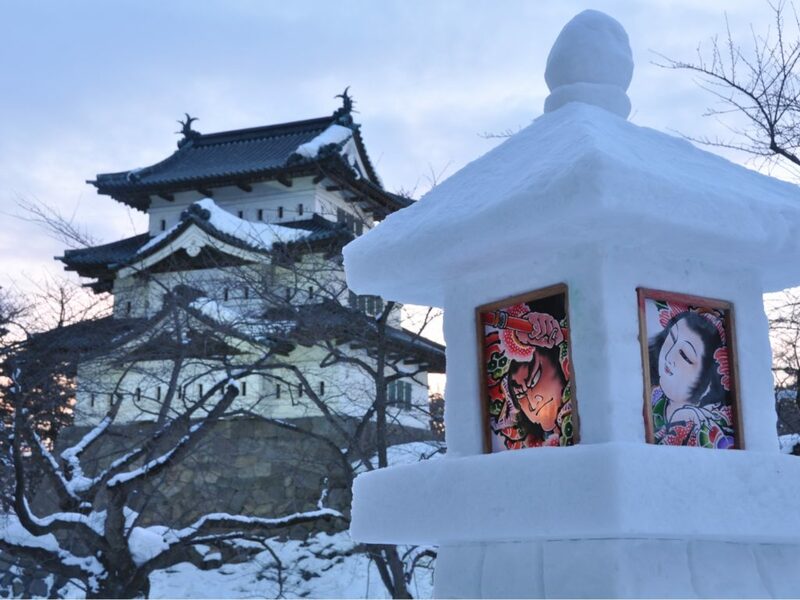 Both taking place in the second weekend of February are the Aizu Painted Candle Festival held at Tsurugajo Castle, and the Ouchijuku Snow Festival. Aizu is one of the three regions in Fukushima, famed across Japan for its painted candles. They have been crafted in this region for over 500 years and are said to burn for longer than their Western counterparts. Not only are the candles painted with seasonal motifs, they are also planted in the castle grounds to form a large picture when viewed from the top of the castle. Aizu-Wakamatsu can be reached via the JR Tohoku Shinkansen from Tokyo Station to Koriyama Station in just under three hours costing around ¥9000. Transfer to the local JR Banetsu-sai-line until Aizu-Wakamatsu Station. The festival is held at two locations around the city. To access Tsuruga-jo Castle, take the Haikara-san Bus or Akabe Bus from Aizu-Wakamatsu Station to the Tsuruga-jo Kita-guchi Bus Stop. For Oyakuen Gardens, take the Akabe Bus from Aizu-Wakamatsu Station to Oyakuen Bus Stop. 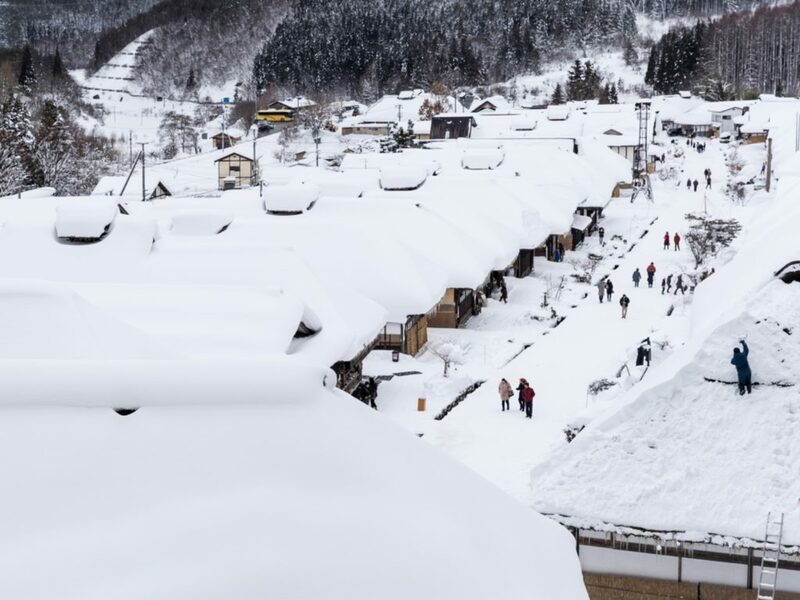 The Ouchijuku Snow Festival is held in an ancient village with the same name during the second week of February. The streets are lined with beautifully crafted lanterns, fully illuminating the thatched roofs of the traditional Edo-period cottages designated as an “Important Preservation District for Groups of Historic Buildings.” The second weekend of February is also the best time to pick strawberries in the region. Following the same information above on how to get to Aizu-Wakamatsu Station, transfer to the Aizu Railway from Aizu Wakamatsu Station to Yunokami Onsen Station and take a 10 minute taxi ride to the festival costing around ¥2000 one-way. So candles and old houses aren’t your thing, but the Urabandai Snow Festival (held on the third weekend of February) has a little something for everyone. At 5:30 p.m. on the first day of the festival, 3000 candles are lit up and placed on a frozen lotus pond. Visitors are encouraged to contribute by leaving their own candles. There’s also snow treasure hunts, craft workshops and some of the most deeeelicious ice cream. From Tokyo Station take the JR Tohoku Shinkansen to Koriyama and transfer to the JR Banetsu-sai Line to Inawashiro Station (around ¥10,000 for the two hour one-way trip). From Inawashiro Station, there are various buses taking you further into the Urabandai region. Alternatively, you can take the train (as detailed in the previous section) to Yunokami Onsen Station where buses run to the snow festival every 40 minutes (costing ¥1000 one-way and taking half an hour). 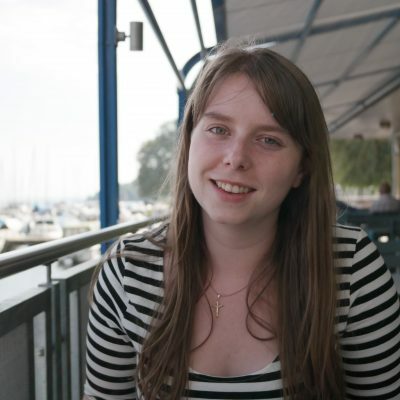 I absolutely loved your blog post! My uncle is moving near Sapporo. He’s going to live there for five years! I can’t wait to tell him about these snow festivals! For me personally; I really want to see the Aomori summer festival. I think it would be really cool and interesting to see all types of floats. I would also like to see the comparison or differences in summer festival between Japan and where I live! Those all look like a lot of fun! I just went to the snow festival in Takasu in Gifu prefecture. Wonderful snow sculptures along with mesmerizing fire and lazer shows! Have you ever heard of Hokkaido? 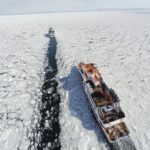 Japan’s final frontier, this northern island is becoming an increasingly popular destination for international travelers. But what’s it like to travel there? 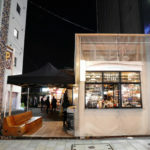 Throw off that kotatsu blanket (go on, you can do it) and head outside to explore these Tokyo's winter-warming street food hot spots.